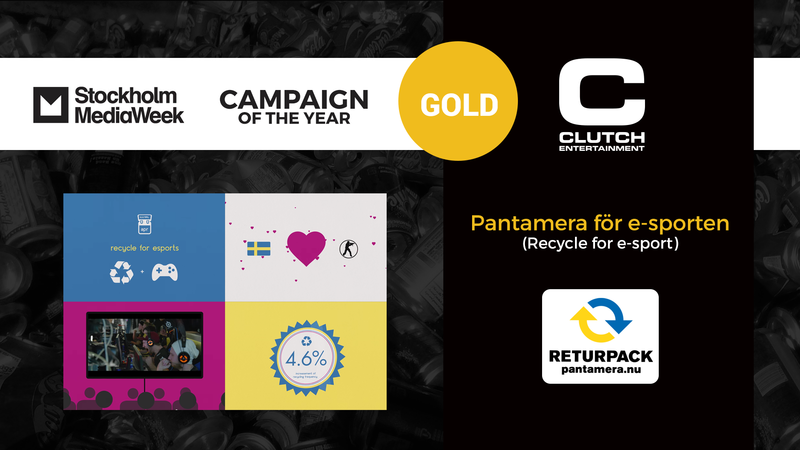 Returpack, the Swedish recycling company, has won gold for the eSports campaign ”Recycle for eSports” during Stockholm Mediaweek, beating other nominated brands such as McDonald’s, Carlsberg and Ben & Jerrys for the prestigious Campaign of the year. The campaign was produced by eSports agency Clutch Entertainment and Scream Media Agency. The purpose of Recycle for eSports is to urge the Swedish eSports audience to recycle their bottles and cans in order to to collect as much money as possible to a tournament prize pool. With tailor made recycling stations at gaming center Inferno Online in Stockholm, the gamers recycled 139.000 cans and bottles to drive up a prize pool of 25.000 euros. The final, won by Fnatic, attracted 6 of the world’s best CS:GO teams and had over 2 million unique viewers on Twitch. In addition, the campaign resulted in over 1000 video clips and 135 articles and increased recycling frequency of energy drinks in Sweden with 4.6%, to reach an all-time high. Stockholm Mediaweek is the major annual event of the Swedish media market where the sector’s most important advertisers, media owners, media agencies and advertising agencies meet. During the two day event awards are given out, such as Advertiser of the year, Media agency of the year and finally Campaign of the year.